First of all, here is a short explanation for the uninitiated. A kadai, also sometimes known in the anglophone world as kadhai or karahi, is essentially a type of deep frying pan that comes from India. Kadais are similar to woks in terms of shape. It’s basically a circular bowl with a flat bottom and two handles on the sides. 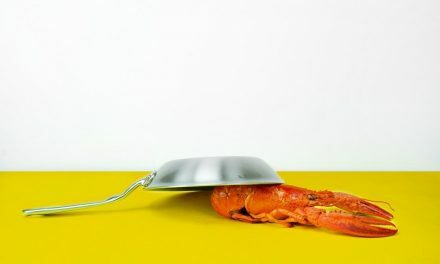 Just like with woks, the traditional two handles on the side are sometimes replaced with one longer pan in modern versions, making it look more like a frying pan. Although kadais have originated in India, they are now becoming popular all over the world and not just for making Indian food. Traditionally, these vessels were used for frying meat and/or vegetables and also for making traditional Indian deep-fried snacks, such as samosa or papadums. Although deep frying is its main use, you can use a kadai to prepare a wide variety of modern dishes too and this is the reason why you definitely need one in your kitchen. Traditionally, kadais were made from steel or wrought iron, but today you can find various versions made from a wide variety of materials. Copper and stainless steel are quite common, but you can also find kadais with a non-stick surface, just like a normal non-stick pan would have. Kadais were traditionally used over an open flame, but the modern versions we are going to talk about have been adapted to modern stoves. Not all of them are compatible with induction cooktops, though, but some of them are. Without further ado, we present to you some of our favorite kadais for deep frying! 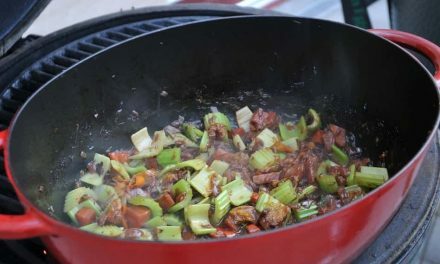 The Futura IL26 Kadai is a great piece of cookware. It’s made of aluminum, but don’t worry, the aluminum will not get into your food and impact your health, thanks to hard anodization. This process makes the surface non-reactive, and also makes the aluminum harder. This results in a tough and durable kadai with superb heat-conducting qualities thanks to the properties of aluminum! This kadai has a flat bottom that is compatible with induction cooktops and the curved sized allow for easy stirring. The pan comes equipped with two sturdy rosewood handles and a stainless steel lid. You can choose between two sizes – 2.5 liters or 3.75 liters. If you like using nonstick cookware, this kadai is for you. 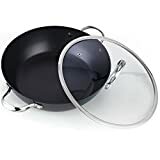 Just like the previous one, it’s made of hard anodized aluminum, but it also features a double-layer nonstick surface which makes it perfect for frying. The diameter of this kadai is 12 inches – not too big and not too small. It also comes with stainless steel handles and a nice warranty. Although this is not the original use of a kadai, you can use this pan in the oven on temperatures up to 450 degrees Fahrenheit. Who wouldn’t like having such a versatile piece of cookware in the kitchen? 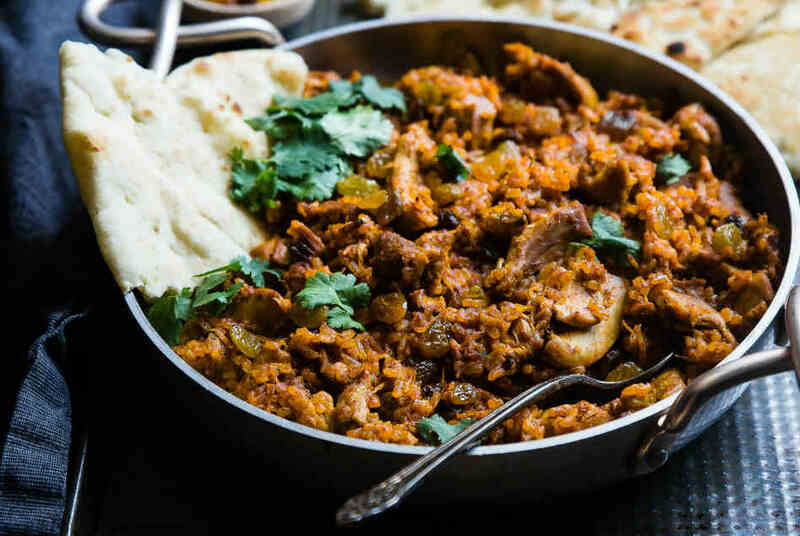 You can use it as kadai but it also doubles as a deep dish for casseroles, for example. Heavy gauge aluminum core provides even heat distribution without any "hot spots"
The Cooks Standard 12-inch all-purpose pan is another beautifully designed pan in the kadai style. Its core is made of heavy gauge aluminum which results in amazingly even heat distribution. This kadai also features a hard anodized surface which prevents food from sticking and makes the cleanup quite easy. A tempered glass lid is also included. This is a nice addition since you can look at your food while you cook – no need to raise the lid and create a mess. You should keep in mind that this kadai is not compatible with induction cooktops, but it’s oven-safe up to 500 degrees Fahrenheit. It is also dishwasher safe. The title says wok, but this pan has all the properties of a kadai. It has a flat bottom, edges slightly curved, and two handles. Most importantly, it is made of cast iron which is one of the materials traditionally used to make kadais. This sturdy and durable pan is compatible with all kinds of stoves, including induction stovetops. 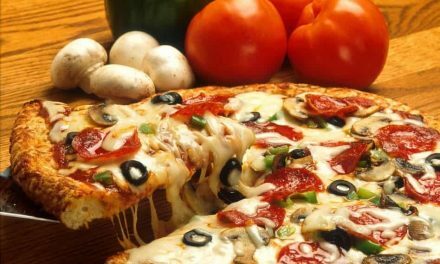 It also comes-pre seasoned, so there is nothing to worry about – you can start cooking right away! This is quite a heavy piece of cookware, but the handles on the sides are nicely designed and make it easy to maneuver and the rustic look of cast iron makes it perfect for serving too. We have shown you some of the best kadais available on the market, but how do you choose the one that is perfect for you? First of all, you should know what size you are looking for. In order to determine the right size, consider the number of people you are usually cooking for. For example, a 12-inch kadai should allow you to comfortably cook for 4 people. However, not all manufacturers state the sizes of their pans in terms of diameter, but in terms of volume instead. In this case, 2.5 – 3 liters means the kadai is big enough to cook for a family of 4. If you are usually cooking only for one or two people, consider choosing a smaller kadai. Don’t go too small, though, since a wider diameter allows for even heat distribution. 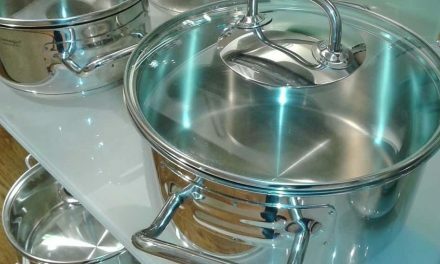 Regarding the material – aluminum is the most common option among the modern versions of kadai. Aluminum transmits the heat really well and it doesn’t react with oil, so it’s really not a bad option. Kadais made of aluminum are light compared to cast iron versions which are rather heavy. Furthermore, kadais traditionally come with two handles on the sides, but you can also find versions with one long handle. Kadais with two handles are easier to maneuver, but one long handle will keep you safe from getting burned by oil.